Rick Steve’s End of Year message, illustrated with my sketches of the bridges of Rome’s Tiber river, launched a hopeful message about the importance of building bridges and not erecting walls. Bridges are indeed a strong symbol of outreach, of communication and connection. They have other connotations too, though. Bridges provide shelter for the disenfranchised (such as the many immigrants arriving in Italy from troubled zones of the planet). They mark the passage of time, as water or vehicles pass beneath them. I wrote on New Year’s Day in my Sustainable Rome blog about the city’s choice of bridges as the venues to welcome the new year. As I biked along the river the week before Christmas, drawing and photographing bridges, I saw a wide range of life: tourists and Romans out for a stroll, biking, jogging, but also the makeshift shelters of the homeless. When I helped organize the public event to inaugurate William Kentridge’s artwork last spring the contrast was glaring, between the homeless denizens of the riverfront and the international art collectors there for Kentridge. The Tiber should be recognized and maintained as the city center’s green lung, the most central green space in a surprisingly green city. 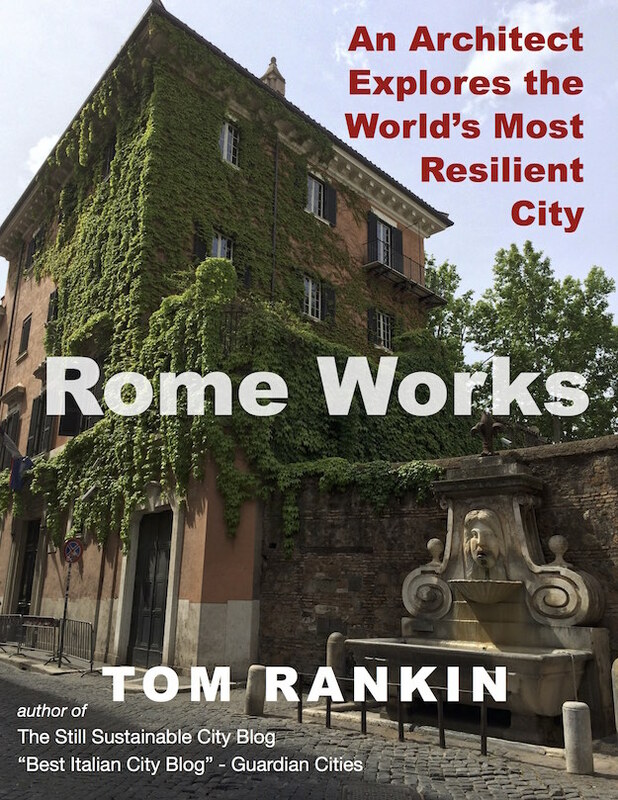 Few people realize just how green Rome is — per capita it has more green space than any European capital. Most of this is on the outskirts, such as the vast archaeological parks of the Aqueducts and Appian Way where I took Rick Steves years ago, but even in the heart of Rome one can descend to the banks of the Tiber River island to find peace and quiet, contemplating history and nature in one fell swoop. It’s pretty chilly now but we’re looking forward to Spring when the city, and its riverfront, come to bloom. Already we are planning some engaging events to help visitors and Romans alike come together along the Tiber riverfront. Sign up for the newsletter for updates.